Teachers, librarians, local historians and teaching artists are invited to explore slavery in New York State, historically and today, with guest scholars, curriculum specialists, and front-line investigative reporters on Friday, December 3, 2010, from 8:00 a.m. to 3:00 p.m. at Heaven Hill Farm, on Bear Cub Road in Lake Placid, New York. 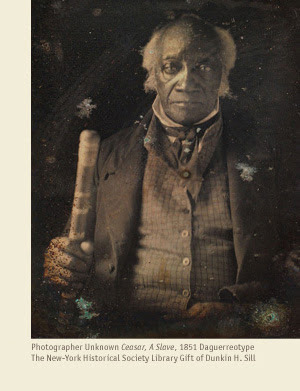 Margaret Washington, Professor of History at Cornell University and award-winning author of Sojourner Truth’s America, a groundbreaking biography examining the harsh realities of Dutch New York slavery that helped forge one of the nation’s greatest and most widely admired reformers. John Bowe, prize-winning journalist and author of Nobodies: Modern American Slave Labor and the Dark Side of the Global Economy, an eye-opening look at labor abuse and cases of outright slavery in the U.S. today. Cost: $55 per person includes a box lunch, lesson plans, and other resource materials. Reduced rates are available at $100 for 2 people or $150 for 3 people per institution. Books and other teaching tools will be available for purchase. SLAVERY IN NEW YORK? SLAVERY TODAY? 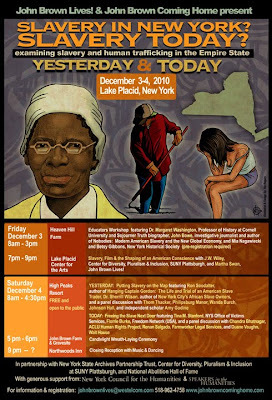 is part of the Anti-Slavery Convention in the Adirondacks on December 3-5, 2010 and is a joint program of John Brown Lives! and Center for Diversity, Pluralism & Inclusion at SUNY Plattsburgh. For information and to pre-register contact Martha Swan (518-962-4758 mswan@capital.net) or Lindsay Pontius (518-962-8672 pontiusequus@aol.com).